The flip-side of Garnered Images Photography. PJ. Garner is the founder and president of A Squirrel’s Tale Wildlife Rehabilitation, Inc. A lifelong animal advocate, she is currently the president of the Michigan Wildlife Rehabilitators Association. She holds memberships in various wildlife rehabilitation organizations and is also a certified Emergency Animal Rescue Services volunteer for United Animal Nations. PJ.’s corporate resume includes 27 years in information technology services for one of the largest IT services providers in the world. She is currently working as the global lead of threat and ulnerability management for one of their largest customers. Her professional skills include writing and presentations, and she leverages those skills in her work with both A Squirrel’s Tale and in teaching squirrel rehabilitation to other wildlife rehabilitators. PJ. 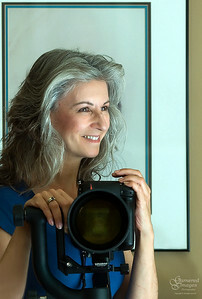 is an accomplished nature photographer, and uses the sales of her photographs to help raise funds for A Squirrel’s Tale. This site is where she shares some of the stories behind the pictures and various other writings. She lives with her spouse (and partner-in-crime) in an old, small jewel of a city filled with trees and squirrels, and is currently writing a book about her wildlife experiences. Visit our online store for great items featuring images from Garnered Images Photography. All proceeds benefit A Squirrel's Tale Wildlife Rehabilitation.